Until 1993, the biological name of the domestic dog was Canis familiaris. A subspecies of the Gray Wolf. It is still frequently referred to as Canis familiaris dingo and Canis dingo. 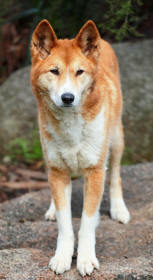 About 70% of dingoes are in fact hybrids with domestic dogs. Also known as the Australian dingo, or Warrigal.